In this Photoshop Effects tutorial, we'll learn how to quickly and easily create a simple photo studio background in Photoshop which can then be used to make any portrait-style photo look as if it was taken in an actual photo studio, even if it was really taken in your office, your kitchen, your neighbor's backyard, or basically any place other than a photo studio. As with most Photoshop effects, this background works best when used with the right type of photo, so since we're trying to make it appear as if the photo was taken in a portrait studio, it helps if the person in the photo is dressed nicely, hair in place, and sitting in one of those completely unnatural portrait studio poses. One other thing to keep in mind before we begin... If you're planning on taking a photo to use with this background, try to have the person (or people) sit in front of a plain white background if possible when you take the shot, since that will make it much easier to select them in the original photo when you go to move them in front of this new background we're about to create. Create a new Photoshop document set to 8x10 inches at 72 pixels/inch. Now, if you know anything about image resolution and print quality, you're probably wondering why I've set my resolution to only 72 pixels/inch, which is far lower than the professional print quality resolution of 300 pixels/inch, and you're most likely thinking that if we go to print this image at only 72 pixels/inch, it's going to look rather horrible, and you'd be right. There's no way we can print our image at such a low resolution and expect it to look good. Don't worry though, we won't be leaving it like this. 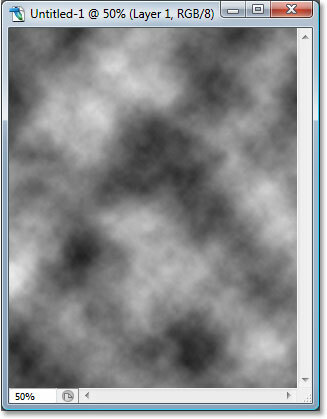 The reason we're starting off at only 72 pixels/inch is because we're going to be using Photoshop's Clouds filter to help us create our background, and the Clouds filter is resolution-dependent and only works well at low resolutions. If we tried to use the Clouds filter at 300 pixels/inch, we'd get a whole bunch of really small clouds instead of a few large ones, and we want the larger ones for this effect. I'll show you what I mean in just a moment. For now though, go ahead and create your new document by clicking OK in the top right corner of the dialog box. Fill the new document with black. Add a new layer by clicking on the "New Layer" icon. The new blank layer added to the Photoshop document. 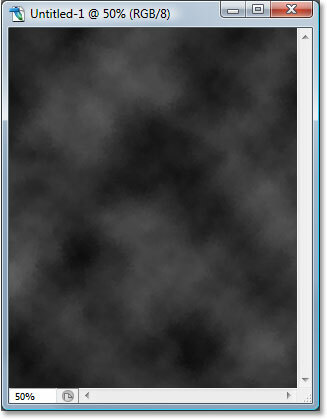 Go to Filter > Render > Clouds to apply Photoshop's "Clouds" filter to the new layer. The Clouds filter gives you something different each time you apply it, so if you want to experiment with it a little to see different variations of the effect, simply press Ctrl+F (Win) / Command+F several times to re-apply the filter and you'll see a different cloud pattern each time. 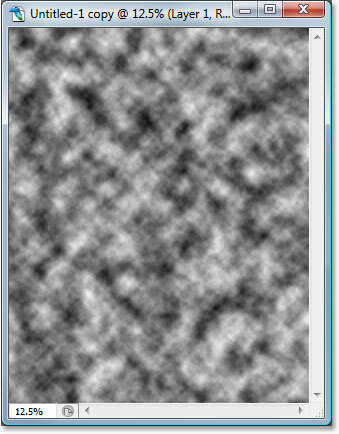 The effect of applying the Clouds filter at 300 pixels/inch instead of 72 pixels/inch. That's a few too many clouds for what we need here, which is why we're running it at a low resolution value. Lower the opacity of the clouds layer to 40% to reduce their intensity and give us a more subtle shading effect. Press "Ctrl+E" (Win) / "Command+E" (Mac) to merge both layers onto a single layer. Add some texture to the background by applying the Spatter brush filter. The clouds now have a "painted" look to them. Go to Edit > Fade Spatter immediately after applying the filter and lower the effect's opacity to 50%. Apply the Sprayed Strokes filter to the background. The background after applying the Sprayed Strokes filter. Go to Edit > Fade Sprayed Strokes and lower the opacity to 50%. Now that we've finished with the Clouds filter, we can increase the resolution to what it should be if we want professional print quality. Of course, increasing the resolution of an image in Photoshop is usually something we want to avoid as much as possible since all you're doing is making the image larger without adding any more detail to it (as powerful as Photoshop is, it still has no way of knowing what the image would have looked like in higher resolution), and you end up with an image that went from crisp and sharp to soft and dull. However, since all we're doing here is creating a background, and backgrounds are often blurred out anyway to bring more attention to the main subject in the foreground, we can get away with it. Change the Resolution value of the Photoshop document to 300 pixels/inch, make sure the "Resample Image" option is checked, and set the Interpolation option to "Bicubic Smoother" (Photoshop CS2 and higher) or "Bicubic" (Photoshop CS and lower). The only difference you'll notice after increasing the resolution is that the image will now appear much larger on your screen if you zoom in to 100%. Click on the "New Adjustment Layer" icon. Choose "Hue/Saturation" from the list. The background after colorizing it with blue. Double-click on the Hue/Saturation adjustment layer's thumbnail in the Layers palette at any time to bring up its dialog box to lighten or colorize the background. We've completed our work on the background, so let's save our Photoshop document so we can use it whenever we need it instead of recreating it each time. To do that, use the keyboard shortcut Ctrl+S (Win) / Command+S (Mac). Normally this is the keyboard shortcut for the "Save" option, but if this is the first time you're saving the document, Photoshop will bring up the Save As dialog box instead, since it needs to know where to save it, what to call it and what format to save it in. Make sure you save the document as a Photoshop .PSD file. Name the document something that makes sense to you ("Studio-Background.PSD" works nicely) and then save it to your computer's hard drive in a location where you can easily access it again. Use the selection tool of your choice to select the person in their original photo. Use the Move Tool to drag the person from their original document into the Background document. 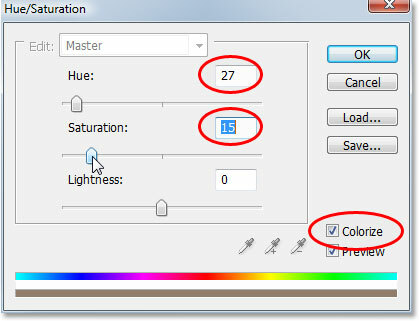 Make sure the Hue/Saturation adjustment layer is selected first in the Background document so the person appears on a new layer at the top of the Layers palette. Drag the person into place in front of the background with the Move Tool. Adding some color to the background with the Hue/Saturation adjustment layer. And there we have it! We've now created a simple portrait studio-style background in Photoshop that we've saved and can re-use, as well as lighten and/or colorize, whenever we need it! Visit our Photo Effects section for more Photoshop effects tutorials!